Virginia Water Radio: Episode 342 (11-14-16): Tornado Research through Virtual Reality at Virginia Tech's "Cube"
Episode 342 (11-14-16): Tornado Research through Virtual Reality at Virginia Tech's "Cube"
All Web addresses mentioned were functional as of 11-11-16. From the Cumberland Gap to the Atlantic Ocean, this is Virginia Water Radio for the week of November 14, 2016. This week, we explore how virtual-reality technology is being applied to research into tornadoes. We start with an audio creation that’s being used in public presentations of that technology. Have a listen for about 30 seconds. You’ve been listening to part of “Tornado,” a creation of Dr. Ico Bukvic, of Virginia Tech’s School of Performing Arts. Using a recording of the April 3, 1974, tornado in Guin, Alabama, Dr. Bukvic created, as he stated it, “an artistic rendering of a tornado.” The resulting audio has been used to accompany visualizations of tornado data in Virginia Tech’s high-technology theater known as “The Cube.” For an introduction to The Cube and its use in severe-weather research, have a listen for about two minutes to part of a Cube tour on October 27, 2016. The speakers are tour leader Zach Duer, of Virginia Tech’s Institute for Creativity, Arts, and Technology; and tour participant Kathryn Prociv, a meteorologist and producer with The Weather Channel in Atlanta. Zach Duer - We’re in a room called The Cube. In this room, we have put a whole bunch of technology to do research and artistic work as well. We have 148 channels of sound in here. We also have 24 motion-capture cameras. The motion-capture cameras use infrared light to see things. And so these little balls—these little markers—are highly reflective in the infrared spectrum. So the cameras track these, and if you put these onto a virtual reality [VR] headset, it knows where you are and where you’re looking, so you can just walk through a space naturally and see it in VR. So right now, we are in the middle of a tornado—our perspective is in the middle of a tornado. This is the tornado in Goshen, Wyoming, from, I believe, it was 2003. With this tornado, they have amazing data. So they were able to get Doppler radar on trucks, and they put them at 90 degrees to an ongoing storm. This isn’t a simulation—this is real data. We’re using these little particles to represent wind—the little dots, blue and green and red. And they’re just moving through the tornado like they would. The purpose for this [use of The Cube for viewing data] is to have more theories about tornadogenesis. Kathryn Prociv – For research applications, why is this important? 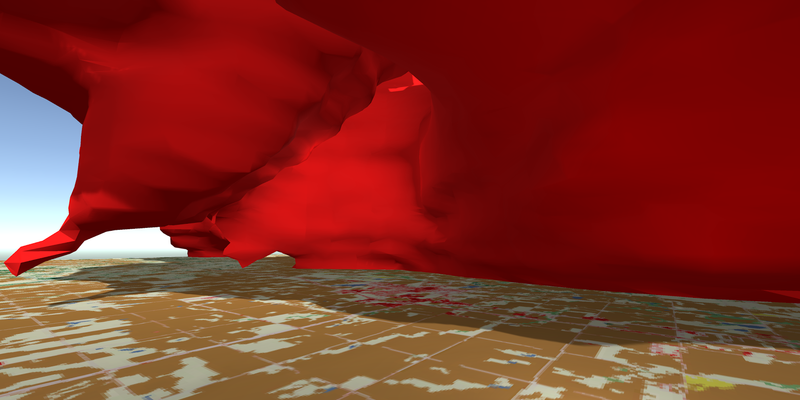 We’ve never modelled wind flow like this before. And when you see it at such a fine scale, you can see terrain interactions, you know, how did the terrain impact the strength of the storm [and] the development? Temperature is important; wind speed is important; and this gives us a way to actually see both of those variables in a space that we’ve never seen. Zach mentioned the El Reno tornado [May 31, 2013, in El Reno, Oklahoma]. That was a storm where several storm chasers were unfortunately killed. And what will make that research important in this space is that we can stand where those meteorologists were caught and see why were they caught there, why was the storm behaving like that, and how did they get caught off-guard. And so that type of research is potentially life-saving for the future. For more Virginia water sounds, music, and information, visit us online at virginiawaterradio.org, or call us at (540) 231-5463. Virginia Water Radio is produced by the Virginia Water Resources Research Center, part of Virginia Tech’s College of Natural Resources and Environment. Thanks to Stewart Scales for his banjo version of “Cripple Creek” to open and close the show. In Blacksburg, I’m Alan Raflo, thanking you for listening, and wishing you health, wisdom, and good water. “Tornado” was created by Dr. Ico Bukvic, associate professor of Computer Music in Virginia Tech’s School of Performing Arts; used with permission. The piece was based on a short recording made during the April 3, 1974, tornado in Guin, Alabama; the recording was provided to Dr. Bukvic by Jim Metzner, producer of “Pulse of the Planet” (online at http://www.pulseplanet.com/). For more information on “Tornado,” please see Dr. Bukvic’ article, “Tornado Simulation,” July 10, 2015, online at http://ico.bukvic.net/main/tornado-simulation/. The tour of Virginia Tech’s Cube was conducted on October 27, 2016, by Zach Duer, an Immersive Environment Specialist at the Institute for Creativity, Arts, and Technology (ICAT) at Virginia Tech. A longer recording (7 min./21 sec) made during the tour is available at this link. Thanks to Dr. Bukvic, Mr. Duer, and Kathryn Prociv for their help with this episode. Still images from weather-data visualizations by Virginia Tech’s Institute for Creativity, Arts, and Technology (VT ICAT). Upper: windfields during a 2003 tornado in Goshen, Wyoming. Middle and lower: reflectivity during the May 31, 2013, tornado in El Reno, Oklahoma. I mages courtesy of Zach Duer, VT ICAT. Associated Press, Horror still vivid in town hard-hit by 1974 tornado, as published by Tuscaloosa [Ala.] News, 4/3/04. Susan Bland, The future of sound begins in the Cube, Virginia Tech News, 5/19/17. Ben Brumfield, “Moore, Oklahoma, looks back on tornado that killed 24 one year ago,” CNN, 5/20/14, online at http://www.cnn.com/2014/05/20/us/oklahoma-moore-tornado-anniversary/. Ico Bukvic, “Tornado Simulation,” July 10, 2015, online at http://ico.bukvic.net/main/tornado-simulation/. 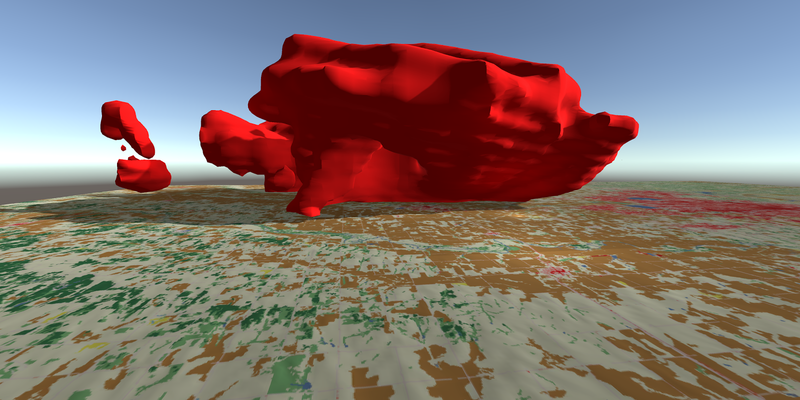 Lynn Davis, Re-creating a tornado in 3-D provides a more effective way to study storms, Virginia Tech News, 2/9/15. Jon Erdman, “Moore, Oklahoma, Tornado 3 Years Later: What Turned It Violent?” The Weather Channel, 5/19/16, online at https://weather.com/storms/tornado/news/moore-oklahoma-tornado-2013-research. [E-5 tornado, May 20, 2013. Brian Howard, “Look Inside Largest Tornado Ever With New Tool,” National Geographic, 12/4/15, online at http://news.nationalgeographic.com/2015/12/151204-tornado-environment-display-el-reno-samaras-storm-science/, (on May 31, 2013, tornado in El Reno, Oklahoma). Mark Prater, Guin tornado survivors recall 1974 storm (Part One), WIAT TV – Birmingham, 4/24/14. Kristina Pydynowski, “El Reno: Widest Tornado on Record Remembered Two Years Later,” ACCU Weather, 6/1/15, online at http://www.accuweather.com/en/weather-news/el-reno-widest-tornado-on-reco/47939108. Virginia Tech Institute for Creativity, Arts, and Technology (ICAT), “The Cube,” online at https://www.icat.vt.edu/content/cube-0. The following episodes focus particularly on severe weather and its impacts. Floods: Episode 86 – 10/31/11 (Historic-record water level marker dedication at New River); Episode 192 – 12/16/13 (Nelson County in 1969); Episode 272 – 6/29/15 (Madison County in 1995); Episode 328 – 8/8/16 (flash flooding). Storm surge: Episode 134 – 10/29/12; Episode 337 – 10/10/16. Tornado preparedness: Episode 256 – 3/9/15. Tropical Storms: Episode 134 – 10/29/12 (Hurricane Sandy); Episode 317 - 5/23/16 (annual season-preview episode); Episode 330 - 8/22/16 (mid-season outlook); Episode 337 – 10/10/16 (Hurricane Matthew). Weather warnings: Episode 106 – 4/9/12. SOLs for gathering and analyzing data for appropriate ages, possibly 3.1, 4.1, 5.1, and 6.1. PS.1 – understanding scientific reasoning, logic, and the nature of science. ES.2 - understanding scientific reasoning, logic, and the nature of science.